Your bedroom is your sanctuary and you definitely want it to look good when you lounge around in your room. 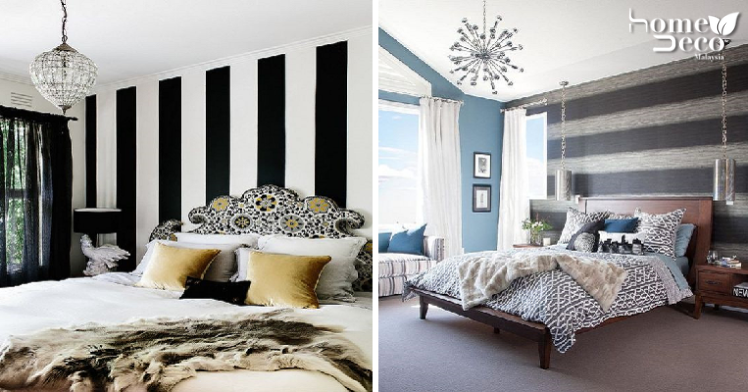 A really easy way to upgrade your bedroom is to make a change on its walls and if you are out of ideas, going for stripes is a classic pattern that won’t go wrong. Stripes can actually be really fashionable and they do not necessarily need to be harsh and sharp. These soft lines on this contemporary bedroom make it look really interesting and helps to make a small room look larger as well. You can try using vertical stripes if you want something different and these metallic stripes look extremely gorgeous. Choosing a metallic colour will make it look really classy as well. Stripes are traditionally vertical or horizontal but who says that you can’t mix it up a little and make it look more outstanding? This little boy’s room is spiced up with some sharp zig-zags that break up the monotony of the horizontal stripes and makes it look more fun. Think out the box and go for these vibrant stripes that will create a fun and quirky atmosphere in your bedroom. Of course, you need to keep the rest of the room’s decor simple to let the walls stand out. If you want something that isn’t too bold then this striped border may just be the thing for you. It perks up plain walls but isn’t so overpowering that you don’t notice other elements in the room. You can even choose to match the decor in the bedroom with the colours of your borders for a more stylish look. There’s nothing more classic than black and white so when you pair it together with stripes, you know that will definitely look outstanding. If you want a style that never goes out of fashion, then this vertical black and white stripes on your bedroom wall are ideal for you.